Flavius Phocas Augustus was Byzantine Emperor from 602 to 610. The early life of Phocas is largely unknown, however he rose to prominence in 602, as a leader in the revolt against Emperor Maurice. He aptured Constantinople and overthrew Maurice on 23 November 602, and declared himself as Byzantine Emperor on the same day. Phocas deeply distrusted the elite of Constantinople, and therefore installed his relatives in high military positions, and brutally purged his opponents. Phocas was an incompetent leader, both of the administration and army, and under him the Byzantine Empire was threatened by multiple enemies, with frequent raids in the Balkans from the Avars and Slavs, and a Sassanid invasion of the eastern provinces. Because of Phocas' incompetence and brutality, the Exarch of Carthage, Heraclius the Elder, rebelled against him. 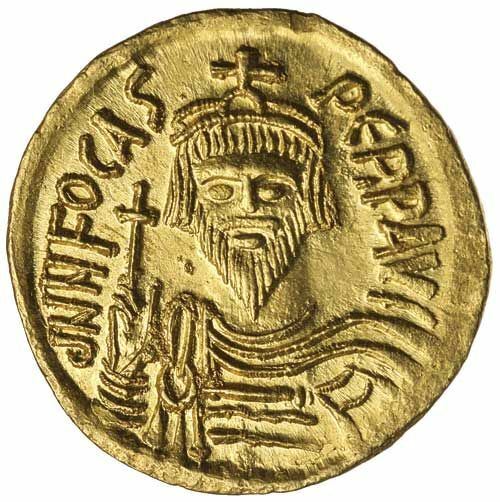 Heraclius the Elder's son, Heraclius, succeeded in taking Constantinople on 5 October 610, and executed Phocas on the same day, before declaring himself the Byzantine Emperor.